George Anderson, Private #3362 in the 28th (North Gloucestershire) Regiment, enlisted into this body of men who fought at the Battles of Alma and Inkerman and at the Seige of Sevastopol. Anderson was born in Durham c. 1832, parish unknown. On the 12th February  the 28th was held in readiness to embark for Turkey at a moment’s notice …. On the 20th February the establishment of the regiment was raised to 57 sergeants, 17 drummers, and 1,000 rank-and-file. Orders were also received to form a depot of two companies, and to draft all men unfit for foreign service and attach them to the depot …. The strength of the service companies was to be 40 sergeants and 850 rank-and-file. After the selection had been made for the depot, it was found the number left would fall far short of that required, whereupon 150 young soldiers from Chatham, who had volunteered from the Indian depots, joined the service companies, and so brought up the regiment to its proper strength. But the material for making an efficient corps for active service was hardly the best kind of stuff. That last sentence, above, was something of an understatement! 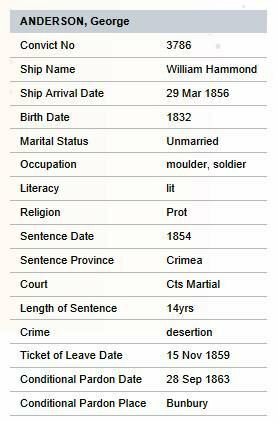 In 1854, when the 28th Regiment left for the Crimean conflict, 31 ‘other ranks’ men faced district courts martial; of these, a dozen took place en route or on Crimean soil [HO86-007]. In the case of George Anderson, he added a district court martial to three regimental courts martial already ‘achieved’. The regimental infringements were mentioned in a later prison record – but not in detail. When the regiment reached Boulahar on the Moroccan coast, Anderson deserted. He was tried on 20th May at Camp Boulahar and sentenced to 50 lashes. Soldiers must have short memories because only two months later, he was in trouble once more – with a more serious outcome. During September 1854 Varna, Bulgaria was the departure port for the British and French fleets bound for Euptoria, Kalamita Bay on the Crimean Peninsula. After serving at Malta and in Turkey, the 28th landed in the Crimea with Sir Richard England’s third division. 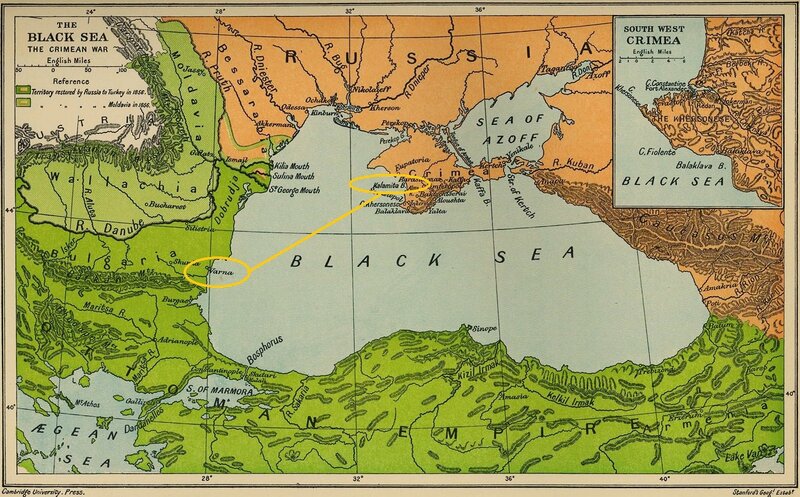 George Anderson was not among them; in fact he did not set foot on Crimean soil – so close but yet so far away! It was at Varna, two months previously, that George Anderson faced a General Court Martial for desertion on 15th July. He was sentenced to 14 years transportation. The verdict was confirmed in England on 5th February 1855. Anderson spent further time confined in Varna and then transported back to England where, on 27th October, he was confined in Millbank as prisoner #27177. His personal details were remarked as 23 years (at trial), marital status single, he could read and write well and was Protestant by religious inclination. Prior to serving in the Army his occupation was a moulder; this may have been making iron or brick castings. The register indicates that he had previously received three convictions at Regimental Courts Martial, but with no indication of when, where and why. During his time in Millbank, his brother, John Anderson, resided in Newcastle-upon-Tyne. Anderson spent a year in Millbank Prison and was then transferred to Portland Prison as prisoner #5328. 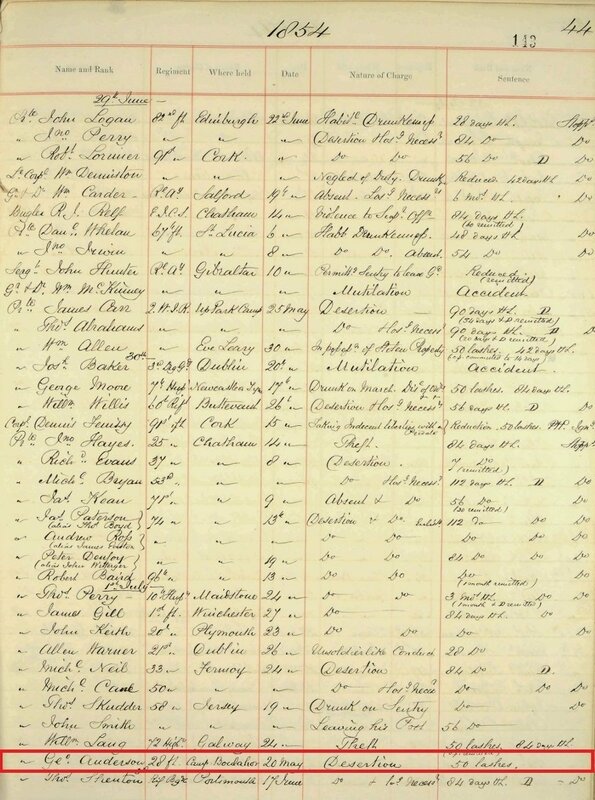 While in that facility he is recorded on 18th November 1855 as ‘reported for irregularity’ in the Prison Governor’s journal along with two other convicts on board. 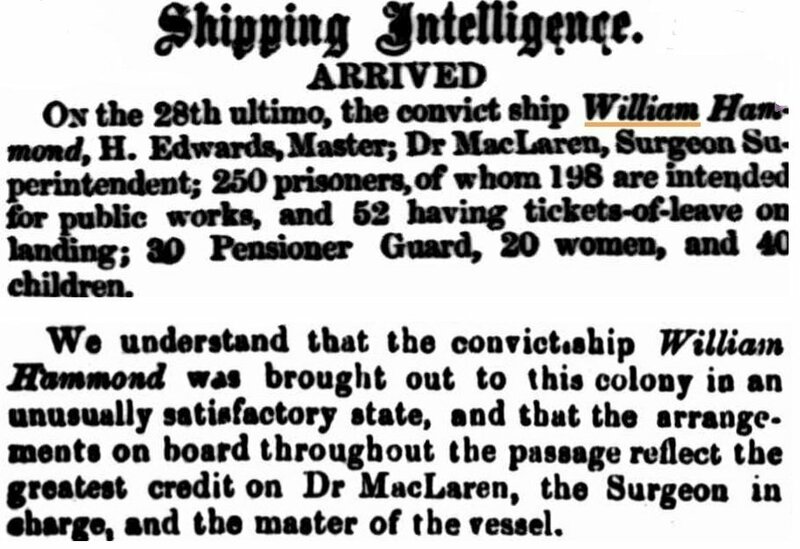 His name appears again a month later when the Surgeon Superintendent of the ship William Hammond inspected all the convicts prior to embarkation. It was noted that these numbered eighty men: 66 for public works and 14 to be granted tickets of leave. Anderson was among the men destined for public works. 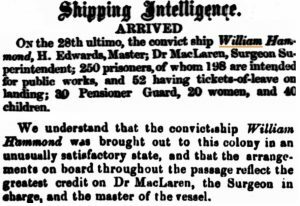 The convict ship William Hammond finally left Plymouth on 5th January 1856 carrying 250 convicts bound for the Swan River Colony. The ship arrived in Fremantle on 29th March 1856 after a passage of 84 days. Anderson was admitted to Fremantle Prison as prisoner #3786. His physical description was recorded as: height 5 ft. 6¼ ins. ; hair light brown; eyes brown; face round; complexion fair; build stout. Anderson’s distinguishing marks were D on his left side, flags, anchor, G R M I, 1854 etc. right arm. Anderson received his Ticket of Leave on 15th November 1859 which took him to Bunbury for work. He received a Conditional Pardon on 28th September 1863. From the lack of newspaper accounts, it would seem that Anderson managed to keep himself out of the limelight for many years. However, to quote from a judgement soon to be imposed upon him, Anderson allowed ‘the curse of drink to get his better feelings to depart from him’. It was alleged that on 13th October 1901, a man named Johnson was found shot at his camp, two miles from Busselton, by ‘Nutty’ Leyland and William Cross, supposed murdered by a man named Anderson who was quickly arrested. The proceedings of the inquest that followed can be read from the West Australian newspaper’s report on 16th October. The coronial verdict of wilful murder against George Anderson was set down for trial at the Perth Supreme Court Criminal Sessions in November 1901. The details of the ‘Busselton Bush Tragedy’ were reported in newspapers all over the State. This account was published in the West Australian on 8th November. Anderson’s sentence of 12 months imprisonment with hard labour for manslaughter appears lenient; other expirees had been hanged for lesser crimes. His Honour, Chief justice Edward Stone, clearly took into account the fact that the accused, ‘an old man’, had been drinking, did not appear to recall the incident and showed much remorse. 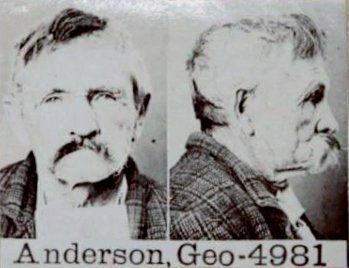 George Anderson was admitted to Fremantle Prison on 5th November 1901. 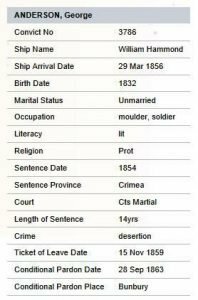 His record (sidebar left) shows personal details that are so different from those on his original Convict record, aging nothwithstanding, he could be a different man! Age, height, eye-colour and religion discrepancies are stand-outs. No registration of death for Anderson can be found in the WA records, but as the comment ‘dead’ is marked on his prison register entry, it is possible he died in prison. There is a calculation in the ‘remarks’ column that suggests he may have been released on 16th September 1902, a month and 19 days prior to his sentence completion date, or perhaps that is the date of his death. No burial record has been found for George Anderson. Historical Records of the Twenty-Eighth North Gloucestershire Regiment from 1692 to 1882, F Brodigan, Blackfriars Publishing 1884. Codrington Papers Ref 6807/377/1, Bundle 4, National Army Museum Templer Study Centre. Judge Advocate General’s Office, District Courts Martial, WO86-007, National Archives, Kew. 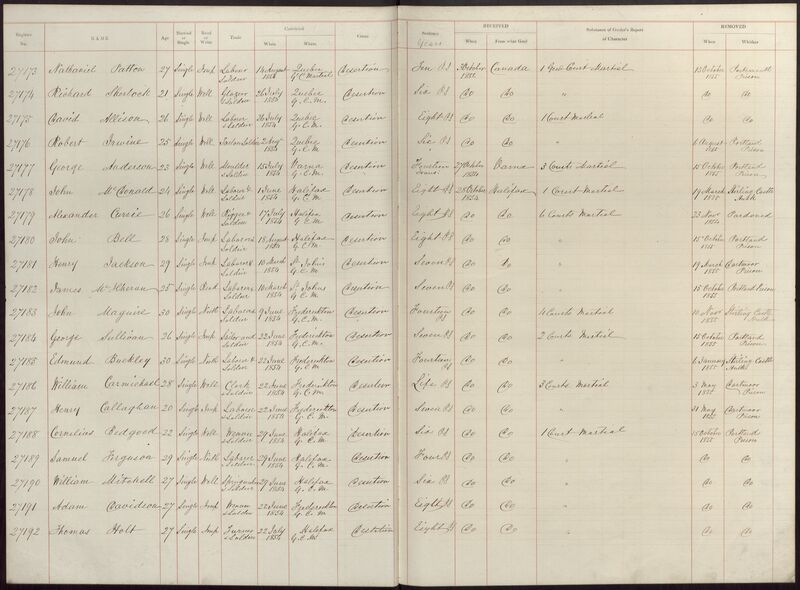 Millbank Prison Register, PCom-35, National Archives, Kew [courtesy Bevan Carter]. 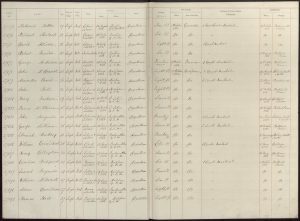 Millbank Prison Register, HO27, Vol. 6, National Archives, Kew. Portland Prison Governor’s Journal, PCOM2-357-205, 216, National Archives, Kew. Newspaper Shipping Intelligence for William Hammond: Inquirer & Commercial News, 2 Apr 1856 and Perth Gazette, 11 Apr 1856. Fremantle Prison Online Databases (accessed 2013 (old version), 2017 (new version). Newspaper articles (a selection) for arrest and trial: Bunbury Herald 17 Oct & 9 Nov 1901. Southern Times 22 Oct 1901. West Australian 16 Oct & 8 Nov 1901. Western Mail 9 Nov 1901. 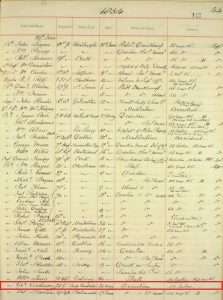 Register of Local Prisoners AU WA S672, Cons 4173-06-48, State Records Office, Perth, WA. 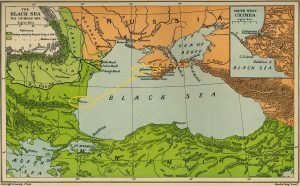 Varna in relation to the Crimea. George Anderson was Court Martialled at Varna for desertion.